Yep, you read the title correctly, this week’s episode is all about heist movies! Returning after a 1 year hiatus is friend of the podcast Jed, and together he and John give their picks for “Good”, “Bad”, and “Ugly” heist movies. Plus a review for the new film “Disobedience”. Heist films run the gamut from silly capers, to all out action, but they all have a few things in common. 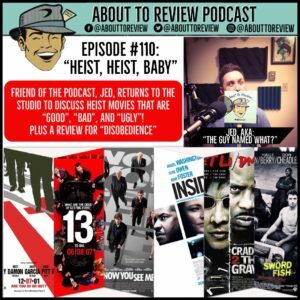 On this episode Jed and John go over what they think makes a good heist film, and then they each give their choices heist movies that fall into the “Good”, “Bad”, or “Ugly” categories. 28m:20s – 33m:10s: John and Jed try to answer the question of what makes a good heist film? Is it the protagonist or antagonist? The setting? The heist itself? The “item” that is being taken? Thank you so much to Jed for making his annual trip to the studio to be on this episode!